After the rain the other day, I noticed a large area near the drill press that had been wet (and the sawdust in the vicinity was still damp), near the edge of the roller door. Frustrating – the roller door edge must be letting water in I thought. It was right below the switchboard, so I was looking around for signs the water had been coming in above the switchboard, but didn’t see anything. It was a bit of an unusually coloured puddle – quite a black/purple, but again, didn’t think anything of it – who knows where the colour had leeched out from (a rag, some old sawdust etc). I needed to turn a pen later in the day, and the drill press is useful in that process, so I decided to have one last look, before writing it off permanently in my mind. 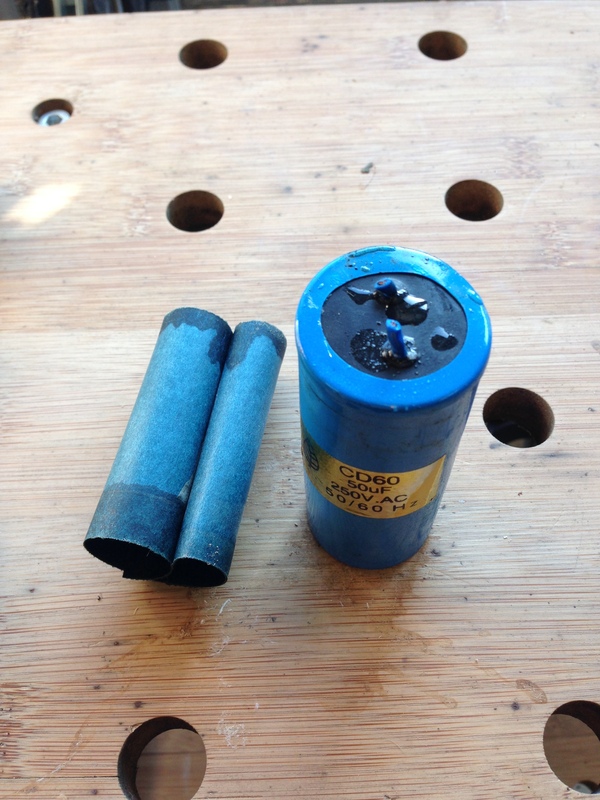 I recently got a new air compressor that had suspected problems with its starting capacitor (turned out not at all), and while investigating, I discovered how simple motor design is, with the capacitors tacked on the side. So I wondered in this case, if was also a capacitor problem, and not something more serious. Of course anything to do with motors etc is the job of an electrician! Took off the covers to the capacitors, and one looked wet. To the extent there were still droplets of liquid on the top, in the plastic retainer, and the ends of the ‘paper’ wrapped around the capacitor were also wet. Bloody hell. How did rain get in there? But I couldn’t see how that was possible. Outside, all the fine dust on the surface was undisturbed – there was no external source of water. Something is not quite right here. There was also a weird smell – acidic smell. 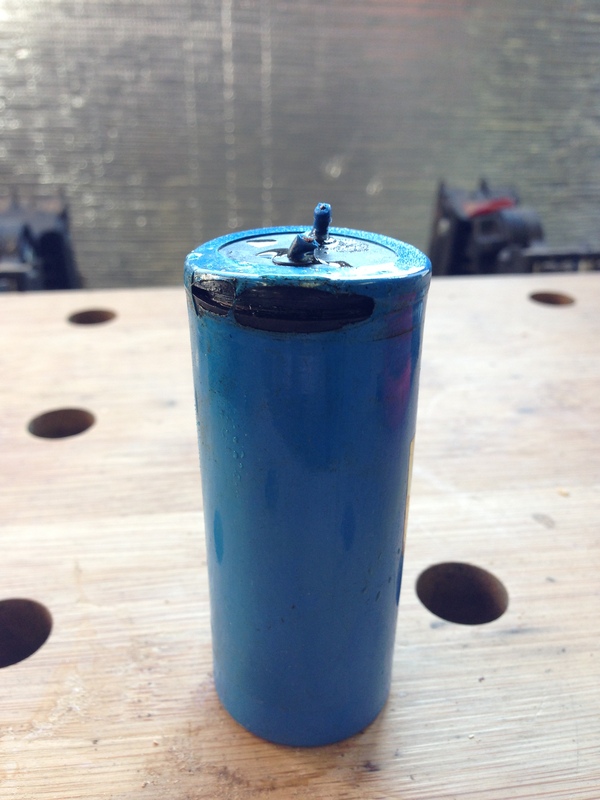 The capacitor (and it was only one of the two – the other looked normal) looked something like a battery that has leaked. Can capacitors leak?? It felt lighter than the other one, but that is neither here or there – they are not rated the same, so that could be normal. One way or another, that capacitor looked US, so I cut it off, with a view to replace it. When I turned it around, I discovered the answers to all my questions. The capacitor had blown. Literally. Blew its top off. The shrink wrap around looked melted in the vicinity. 2. 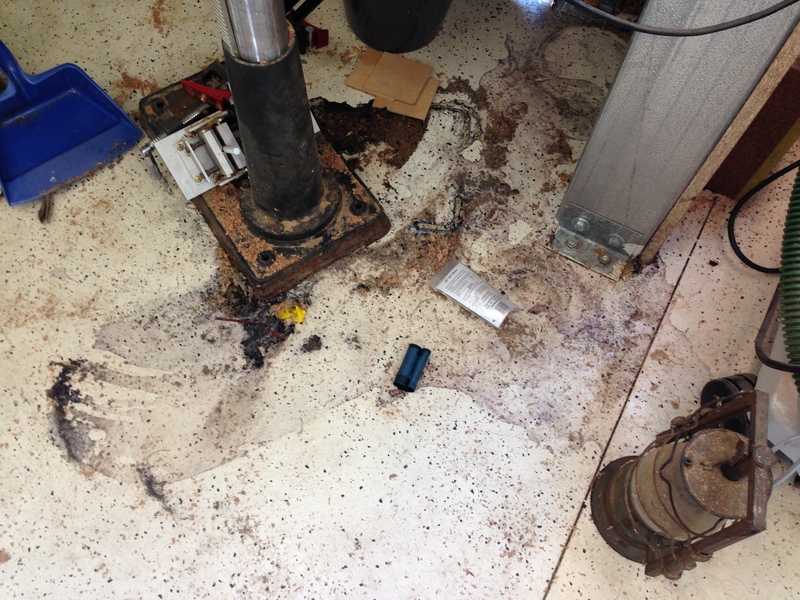 The shed hadn’t rained on the drill press – the liquid in and around the capacitor was internally sourced. 3. The shed roller door may not have leaked – the liquid on the floor must have come from the capacitor (and there was a lot of it), so whether it had mixed with a bit of rain seepage, who knows. But the strange colour (and very strange odor) definitely had come from the capacitor. Sourcing a replacement isn’t so easy – the few placed I tried (including Jaycar) had nothing in that range. Anyone know where a 50uF, 250V AC, 50/60Hz capacitor can be sourced from, let me know! 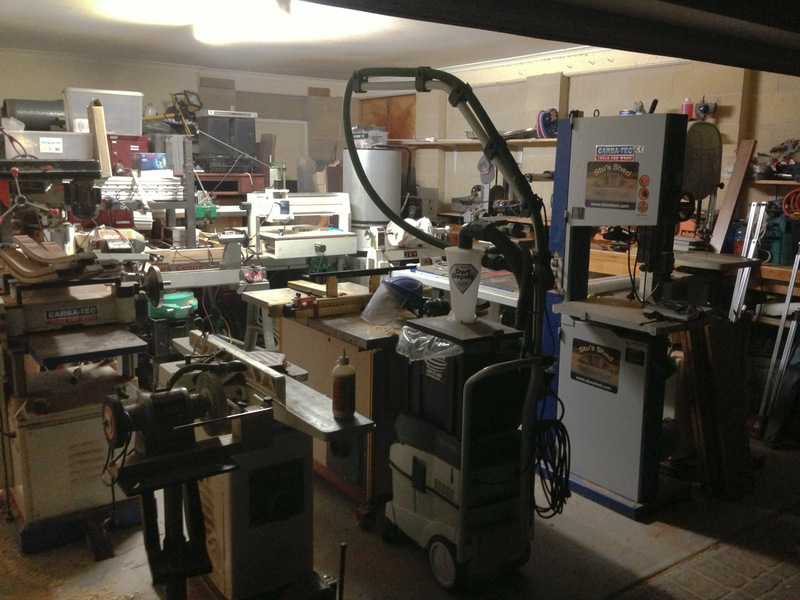 One way or another, I’ll be able to get the drill press back into operation, but it will find its way to the sale area anyway. I need something bigger (as in more power). It is 3/4 HP and wasn’t very expensive at the time, but my needs have changed! 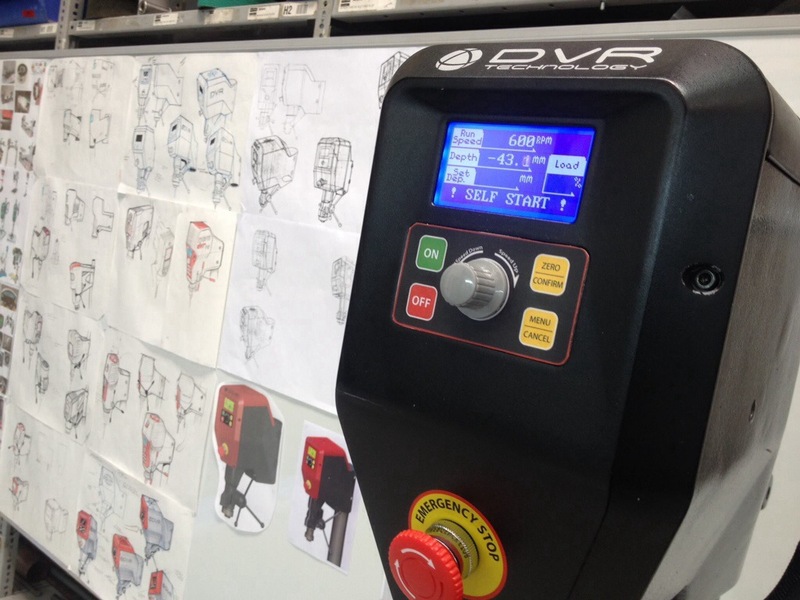 The 2nd gen DVR drillpress is in NZ at the Teknatool laboratory, being put through its paces. Must be getting closer to a release candidate. Can’t wait! It is a little known fact that although crop circles have all but been proven as hoaxes by the scientific community, dust circles also exist. Unlike the crop circles in wheat and other agricultural produce, dust circles are created, not in the dust as the name implies, but in solid wood, which in turn creates a lot of dust. (Perhaps better called dust-creation circles). Some still suspect the hand of man is involved in these creations, but overwhelmingly, the dust circles have been subsequently used in furniture making and period details, disguising their true origins. They then go by another name, one you may be more familiar with: rosettes, as they also are representative of flowers and this second term is the French diminutive of rose. In modern times, companies have provided woodworkers with the tools to make their own rosettes that they can use to add period details to their creations, and it is one of these tools that we are looking at today. Unlike many other rosette cutters I have seen in the past, the one from Toolstoday.com has some unique features that are particularly interesting. For one, the cutter has replaceable/exchangeable carbide edged knives. Rather than spending money on the shaft and body of the cutter each time, you can buy the much more affordable cutters of different profiles and insert the style you want for a particular job. Being carbide edged, these are sharp with an enduring edge. There are 15 different rosette profiles to choose from, as well as blank knives that you can have made to a specific custom design. The cutter may look like a router bit, but it is far from it (and would be incredibly dangerous if mounted in a high speed router). The shaft has flats on it, which is an excellent feature as these allow the teeth of a drill chuck to grip it firmly and prevent slippage. 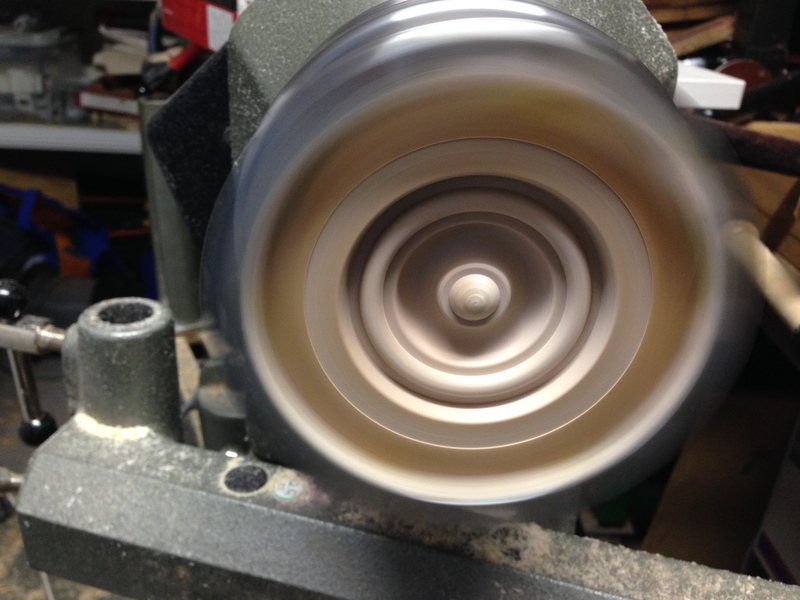 They are designed to be used in a drill press, lathe, mill or similar, running around 800 RPM or so. However, as I found as well, the drill press has to be heavy duty. My floor pedestal drill may be ok for basic drilling operations, but it was not up to the task of a rosette cutting operation. Too much runout in the shaft, too much slack in the components, and the rosette cutter had a tendency to whirl offcentre, and the subsequent vibration was not able to be resisted by clamps, table or drill head, and the chuck kept falling out. 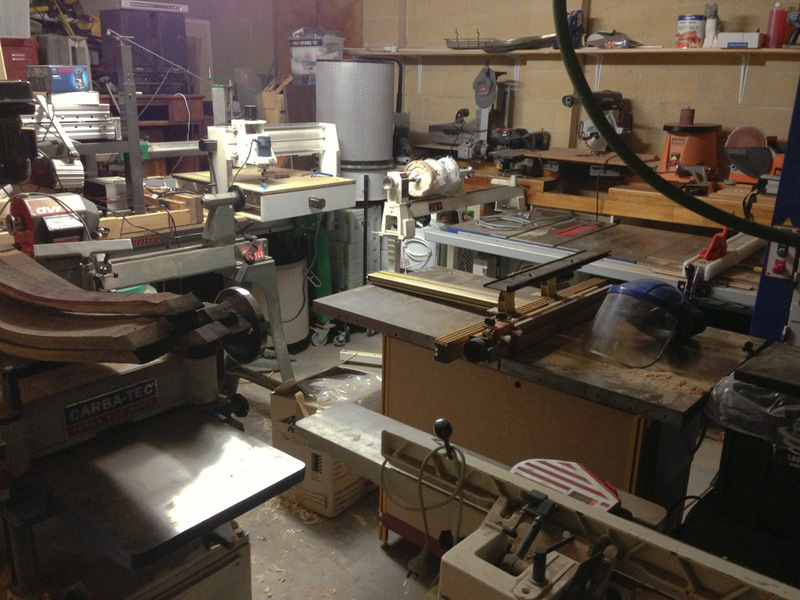 However, I may not have the best drill press (yet – as in that one will get sold once I have a replacement lined up at some stage (hopefully the Teknatool DVR drill press won’t take forever to come to market)), but my lathe is well up for the challenge. 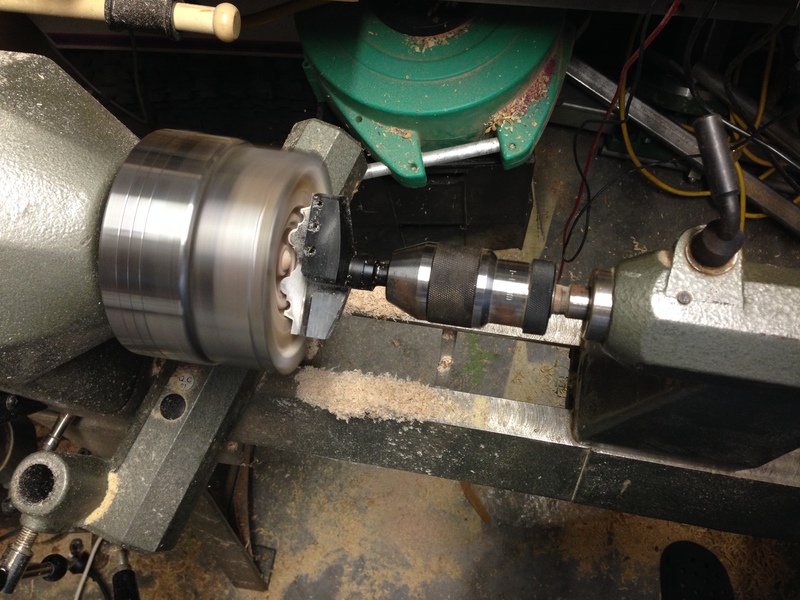 With the chuck (and MT2) secured in the tailstock (with the rosette cutter), and the workpiece held in the lathe chuck, the workpiece was spun up to 1000 RPM, and the non-rotating tailstock wound in. The net result is the same effect, and the whole system a lot more stable than my drill press. In this case I was looking more for a test, so grabbed a scrap of timber that the jaws could grip easily. It was prone to tearout, so the rosette wasn’t as pristine as is possible, but still it confirmed the proof-of-concept. Back to the rosette cutter, and just to reiterate those points – tungsten carbide blade edges, interchangeable knives, and solid body – it is a serious rosette cutter. I was thinking that it would make for an interesting wheel cutter if the particular knives were made, and being interchangeable, you could have a much wide range of sizes, and wheel types without the cost of a full wheel cutter each time. 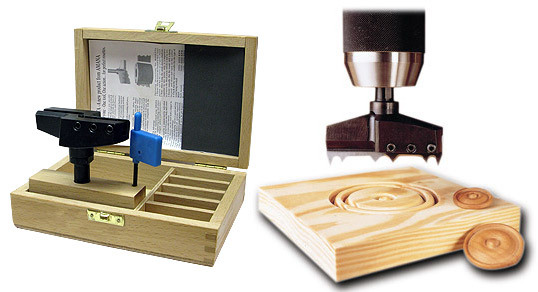 You can get this particular rosette cutter here, knives here, and start making your own dust circles! This is something I have really been looking forward to ever since I heard it was being developed. As mentioned a ways back, Teknatool (inventors of the 4 jaw self-centreing chuck for wood turning, and the DVR lathe) have turned their attention to other products that could benefit from the significant ease of operation, power and easy variable speed of the DVR motor. 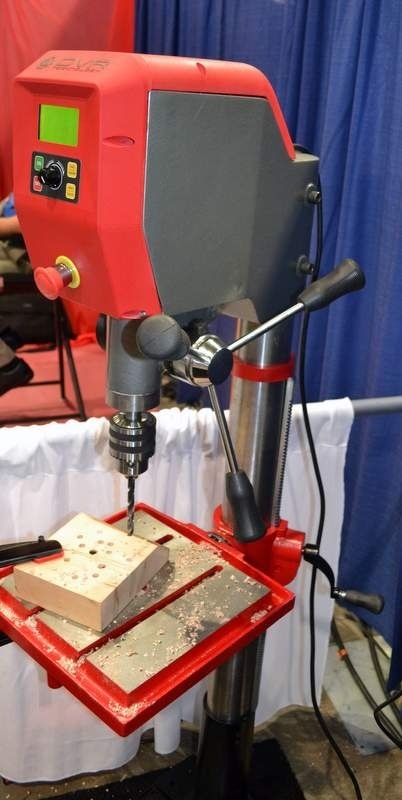 One such product is the drill press, and Teknatool have chosen the Wood show in Las Vegas to demonstrate the prototype. It is a perfect synergy. 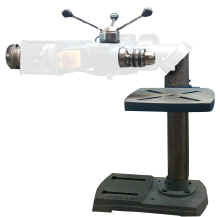 The drill press is constantly assessing the drilling operation. If the computer detects anything abnormal, such as a catch (happens often as the drill bit is just exiting the workpiece on the far side, which sometimes results in it simulating a helicopter! ), a slipping bit etc, the motor will cut out surprisingly quickly. 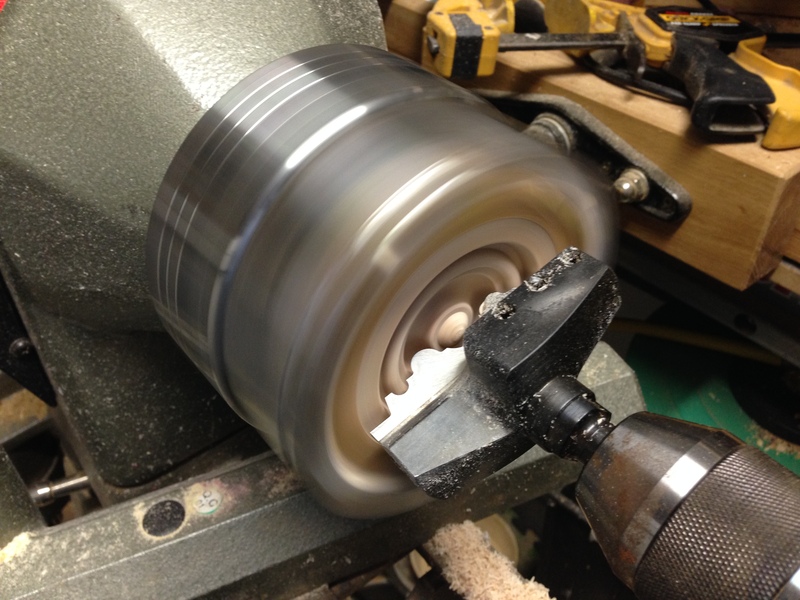 They use this same feature on the lathe for when the chisel takes too big a bite and catches. It can detect if your bit is blunt or damaged, or if you’ve gone and caught some clothing around the bit. This is going to be an awesome drillpress! Complete control over the variable speed, digital speed readout, constant speed with the DVR motor ramping up the power as needed to maintain the speed under load. Expect around 9-12 months before products start hitting the shelves. Given that the motor is direct-drive to the shaft, I was surprised to see that the head is fixed, and cannot tilt, and the table is such a traditional design with a coarse thread height adjustment. Wasn’t expecting that – it still leaves a margin for inaccuracy if the operator doesn’t level the table properly. 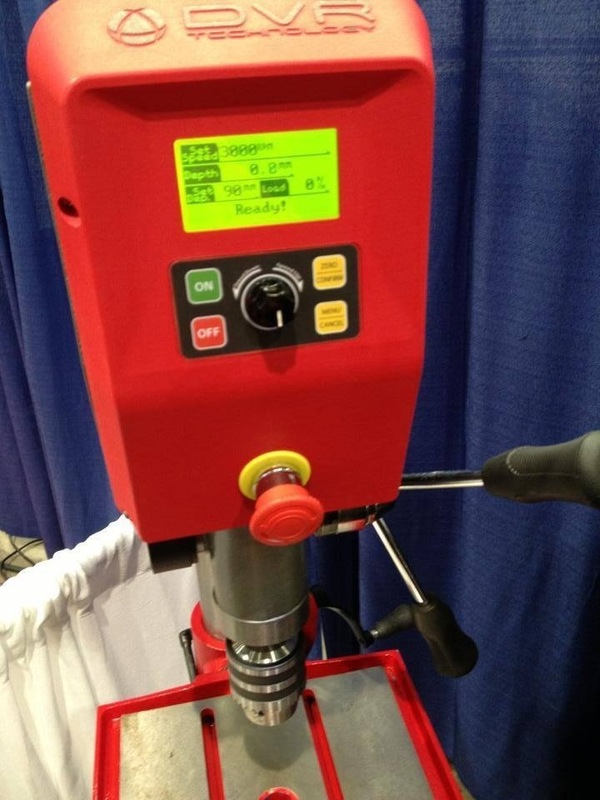 It may be that this is an example of the head-only model (will seek clarification) – they are first releasing the drillpress head, so you can upgrade your existing drill press, and then down track releasing a full drillpress model. 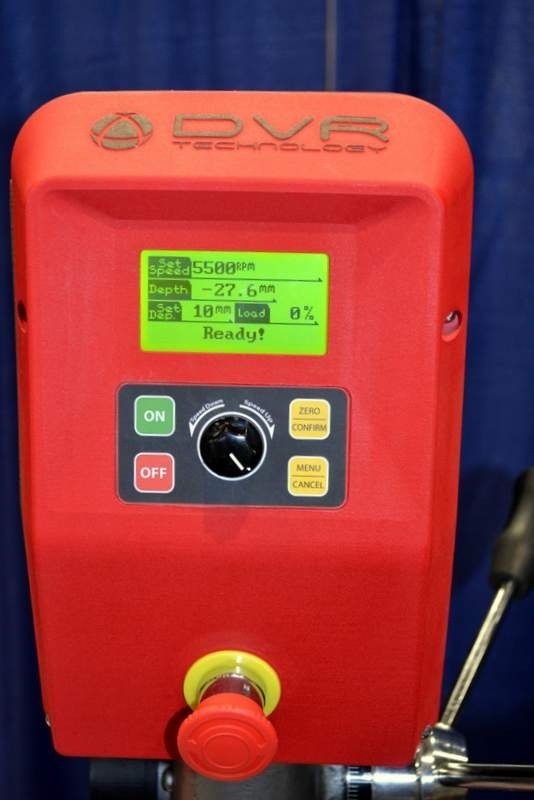 Upgrading an existing drill press will obviously be cheaper, but you have to wonder what innovations Teknatool will bring to the lower half of the drill press! ***Update*** I can confirm that this specific example was a DVR drill press head mounted on an existing base, and is not an example of the full Teknatool/Nova Drillpress solution. 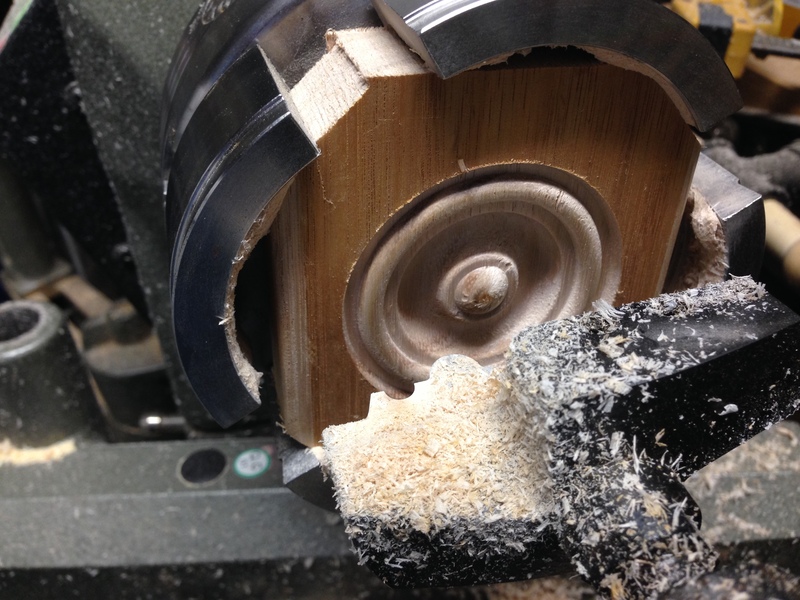 Irrespective, the addition of DVR technology into the drill press is a massive step forward, and I am certainly looking forward to the next tool to receive the DVR treatment – the tablesaw is certainly in their sights. Will this become a serious contender to the SawStop? 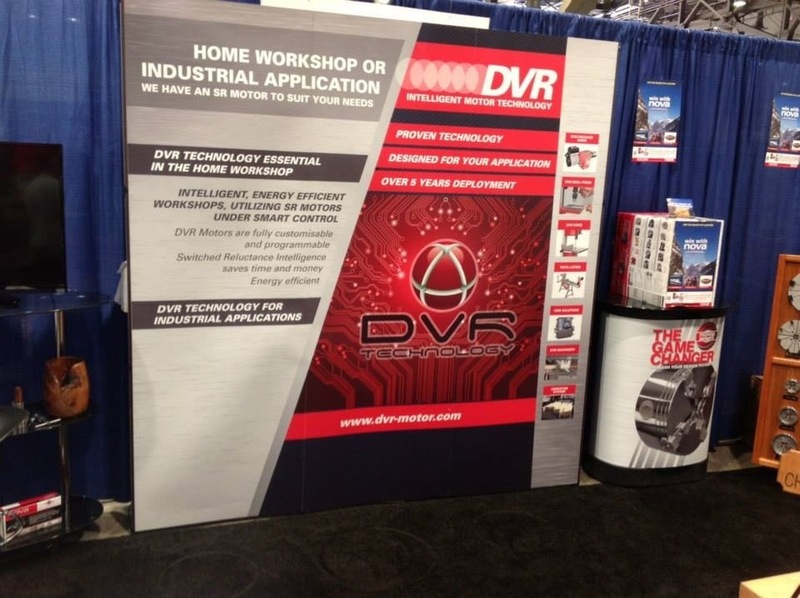 The DVR motor may be capable of providing that sort of capability, and without the blade destruction of an aluminium brake slamming into the blade teeth. Of course I am speculating wildly! In any case, I can’t wait to see the new drillpress on the market!